Gold Cross High Temperature Dyes are specially formulated dyes that will achieve strong yields on cotton, linen, tencil, hemp, rayon, nylon and woolen garments and their blends. 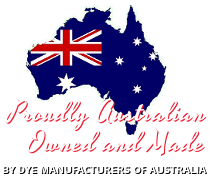 They are easy to use, heat set dyes that are produced in a range of over 30 colours. These standard colours may be blended to produce an unlimited variety of colours. Gold Cross High Temperature Dyes are vibrant, permanent and colour-fast when treated in accordance with the directions. The 10g pack contains 10g of dye in a heat sealed packet within a plastic phial. This amount of dye is sufficient for 1/2 kg of dry weight fabric (or about two average sized t-shirts). Unused dye may be stored for later use in the resealable, screw cap phial. The 10g pack is ideally suited for dyeing one or two items (e.g. School sports shirts) in an economical, user-friendly manner. Simple and convenient, the 10g pack is the most popular produce in our range. It appeals to both the serious craft dyer as well as the one off dyer who is looking to freshen an existing colour or perhaps update to a more fashionable one. NOTE: This product is not suitable for use in Front Loading Washing Machines. The washing machine pack has been specially designed for the dyeing of larger garments that are unsuitable for pot dyeing due to their size. The dye and agent in this pack are blended so that they will react in lower temperatures (such as hot water from washing machines). These packs are usually used for items such as curtains and bedspreads, which are not laundered as frequently as clothing. The colour-fastness in washing machine packs is not as great as that achieved by boiling the garment but the colour yield is comparable.